For daily or more days trips! ( you can also have a daily tjrip to Aigina island , Agistri and the others islands around, and spend a wonderful day with your friends with our boat). Come and sail with our most artistic 41 feet sailing boat Jeanneau Jin fizz 41 feet built in 1989 and refurbished in 2012. Enjoy the magical blue sea and sun of Greek islands. Snorkeling, diving, canoeing,sunbathing and fishing is a small number of the possible activities while you cruise with us. Enjoy your summer holidays in Greece with an elegant classic, sailing yacht. Charter a yacht and visit our beautiful islands. Swim in crystal clear waters at our clean beaches and take a holiday with us and your happy memories will last a lifetime! You can have our personal guarantee for high quality, comfort and safety. 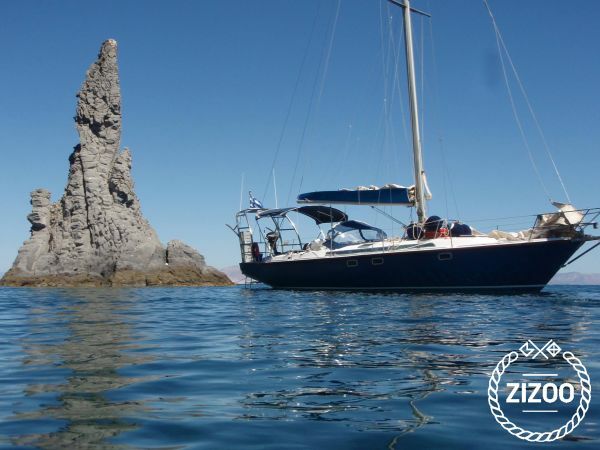 You will have the opportunity to live a wonderful sailing experience, with your own sailing boat, visit every day different Greek islands , swimming in the exotic crystal waters and feel the heat and the sand under your feet. We are waiting for you!!! Skipper is obligatory and he has his own separate cabin. For less than 7 days charter please contact in advance.